The treatment effects of chemotherapy and immunotherapy can be compared based on disease recurrence and progression. BCG has a better demonstrated efficacy in preventing recurrence and progression in current literature, while chemotherapy with MMC or epirubicin is considered less effective. Two earlier randomized prospective trials reported, on the contrary, no difference in their efficacies, although the patients were not categorized and one is intermediate risk of recurrence., Meta-analysis studies, on the other hand, support the superiority of BCG, especially in high risk of recurrence., Moreover, the long-term Phase 3 randomized control trial European Organization for Research and Treatment for Cancer (EORTC) 30911 also supported the superiority of BCG over chemotherapy, regarding recurrence, progression, metastasis and disease-free survival, not only limited to high-risk group but also intermittent-risk group. Consistent finding that has emerged from the above studies, however, more severe drug toxicity (e.g., side effects of cystitis or hematuria) were observed when treat with BCG. In this study, we discuss on patients with new diagnosis, treatment-naive T1 high-grade urothelial cell carcinoma and directly compared the efficacies of the two adjuvant regimens: MMC and BCG as adjuvant intravesical instillation therapy after TURBT. This is a retrospective chart-review study and we analyzed patients with newly diagnosed T1 high-grade urothelial cell carcinoma who admitted to the Taichung Veteran General Hospital from 2008 January to 2015 December. All patients provided informed consent before treatment, and the research protocol was approved by the institute review board of Taichung Veterans General Hospital (approval certificate CE13240A-3). All patients received TURBT with pathologic confirmation of the urothelial cell carcinoma. Tumor staging followed the TNM classification and the tumor grading followed the 2004 WHO classification for papillary lesions, and only those with T1 high-grade urothelial carcinoma were analyzed here. Pathologic report confirmed lesion invade to lamina propria without muscle invasion, while muscle fiber was identified in deep-cut specimen. We recorded their preoperative parameters such as age, body mass index (BMI), gender, and creatinine and cancer-specific parameters such as end-stage renal disease (ESRD), smoker, Chinese herb, and hair dye. Tumor-specific parameters were derived from cystoscopic and pathologic findings. In doubt of incomplete resections, TURBT was repeated 4–6 weeks after the initial surgery. Patient with synchronous or metachronous upper tract urothelial carcinoma with pathology T2 or above, cuff margin positive, or residual ureteral orifice would be excluded due to the fact that they may need further adjuvant systemic therapy or there is doubt for cuff recurrence. Immediate instillation with chemotherapy would be applied or not within 24 h after TURBT, and about 3–4 weeks later, patients would receive a course of 6-weekly adjuvant intravesical instillations with MMC or BCG. In the BCG group, each patient was given 2–8 × 108 colony-forming units of Tice BCG. Follow-up strategy was the following: 3-monthly cystoscopy, urine cytology, and 6-monthly upper tract imaging with retrograde pyelography, intravenous pyelography, or computed tomography urography. End point evaluation was defined as pathologic evidence of tumor recurrence or progression into muscle invasive urothelial cell carcinoma. Maintenance schedule followed the EORTC strategy with three-weekly instillations at 3, 6, 12, 18, 24, 30, and 36 months. Adverse effect was also recorded while cystitis means low abdomen discomfort with pyeuria but no bacteria growth. Urinary tract infection means above symptoms with or without fever, with confirmed bacterial growth. BCG infection means systemic infection with confirmed mycobacterial infections. For statistical analyses, the Mann–Whitney U-test and Fisher's exact t-test were used for continuous variables and Chi-square test for categorical variables. Kaplan–Meier survival curve was used to determine the recurrence-free survival and progression-free survival and log-rank test was used to evaluate intergroup differences. All statistical tests were carried out using IBM SPSS version 22 for Windows (SPSS, Chicago, IL, USA), with P < 0.05 being considered statistically significant. We compared data from 118 patients in the MMC group and 68 patients in the BCG group, with results shown in [Table 1]. No difference was found in terms of their age, BMI, gender, hypertension, and diabetes mellitus. Creatinine levels were higher in the MMC group (1.93 ± 2.55 vs. 1.36 ± 1.24, P = 0.002) and more ESRD cases were found in the MMC group (17.8% vs. 8.8%, P = 0.094). In terms of tumor parameters, no inter-group difference was found regarding multiple lesions (≥2) (75.4% vs. 75.0%, P = 0.949); however, regarding tumors of large sizes (>3 cm) and carcinoma in situ (CIS), we found them more prevalent in the BCG group (14.4% vs. 26.5%, P = 0.043; 22.0% vs. 36.8%, P = 0.030). We found that 23 patients coexisted with upper tract urothelial cell carcinoma (UCC) in the MMC group, compared with seven patients in the BCG groups (19.5% vs. 10.3%, P = 0.100). For these patients, nephroureterectomy with bladder cuff excision was performed and showed pathologic findings of pT1 or less that required no further adjuvant therapy. A total of 65 patients received immediate chemotherapy instillation in the MMC group compared with 28 patients in the BCG group (55.1% vs. 41.2%, P = 0.068). From all these patients, 83 of them (44.6%) showed recurrence and 16 of them (8.6%) experienced progression during the follow-up period (average 41 months). The treatment efficacies of immediate MMC are shown in [Figure 1] and [Figure 2]. We found no intergroup difference in the prevention of recurrence and progression of disease (recurrence: 39/93 vs. 44/93, P of log rank test = 0.582; progression: 11/93 vs. 8/93, P of log rank test = 0.311). 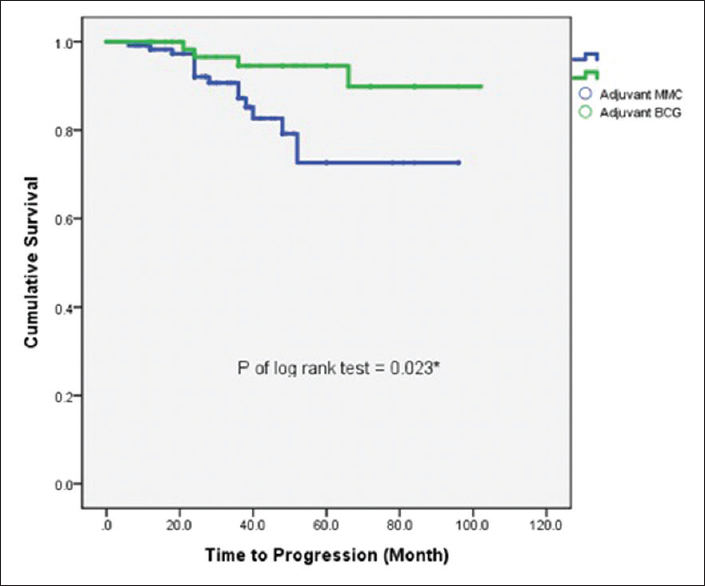 In [Figure 3] and [Figure 4], the adjuvant MMC group, compared with the BCG group, showed a slightly lower efficacy in the prevention of recurrence and progression (recurrence: 59/118 vs. 24/68, P of log rank test = 0.008; progression: 15/118 vs. 4/68, P of log rank test = 0.023). [Table 2] shows the risk of recurrence among the T1 high grade patients as determined through the uni-multivariate COX regression model. The superiority of BCG appeared significant in the univariate analysis model (hazard ratio [HR] = 0.537, 95% confidence interval [CI] = 0.332–0.869, P = 0.011). In addition, the treatment efficacy of BCG in prevention of recurrence was further adjusted in model 1 (HR 0.511, 95% CI = 0.304–0.858, P = 0.011*) and model 2 (HR 0.481, 95% CI = 0.278–0.835, P = 0.009*). 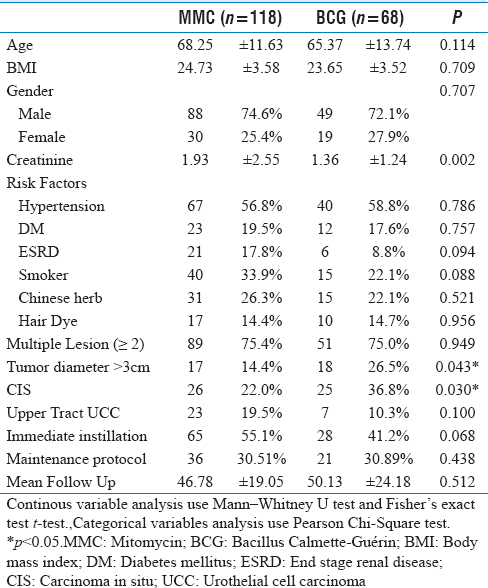 Further, smoker, multiple lesions, tumor diameter >3 cm, upper tract UCC appeared to be the risk factors for tumor recurrence. 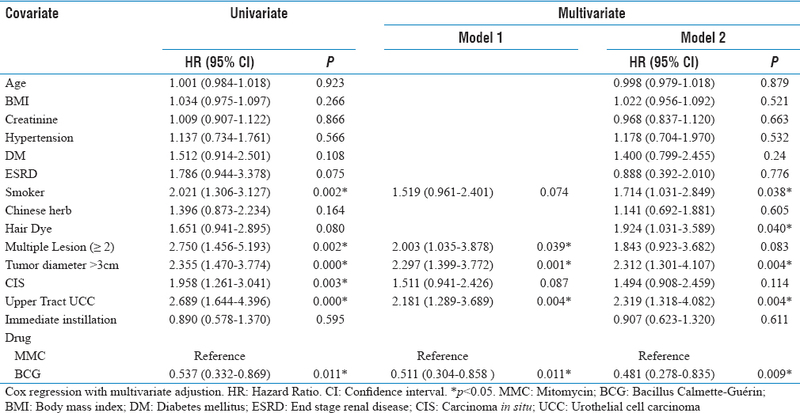 In [Table 3], the superiority of BCG in preventing tumor progression was significant after adjusting for risk factors (model 1: HR 0.216, 95% CI = 0.068–0.683, P = 0.009*; model 2: HR 0.193, 95% CI = 0.055–0.674, P = 0.010*). Tumor diameter was found as the independent risk factor for tumor progression (HR 5.227, 95% CI 1.769–15.444, P = 0.003*). [Table 4] lists the treatment side effects of both groups and results showed no difference in terms of cystitis, urinary tract infection and hematuria, with 4 patients (5.89%) experienced BCG infection in the BCG group. Our study suggested that in treating T1 high-grade urothelial carcinoma of urinary bladder, as post-TURBT adjuvant instillation therapy, the regimen of 6-weekly BCG is more effective than MMC as in terms of tumor recurrence and progression. 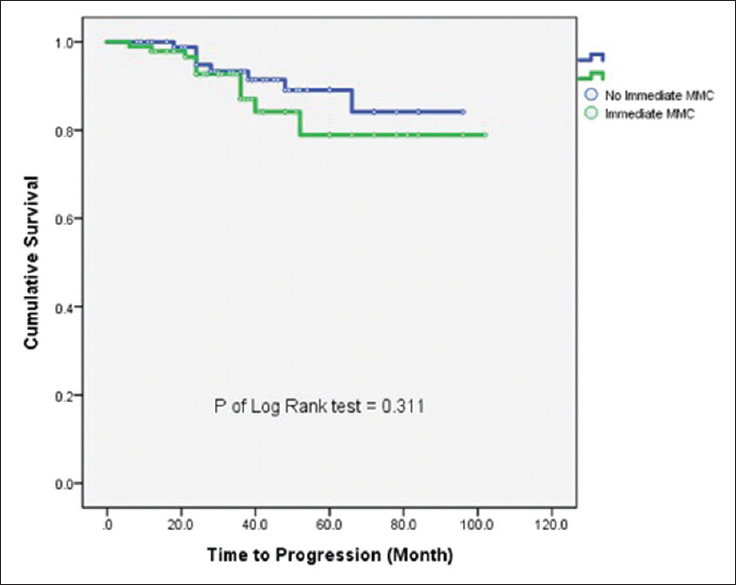 Further, single instillation with MMC was not effective for treating T1 high-grade tumors. Although T1 high grade is classified into nonmuscle invasive bladder tumor, it harbors the high recurrence and progression rate. 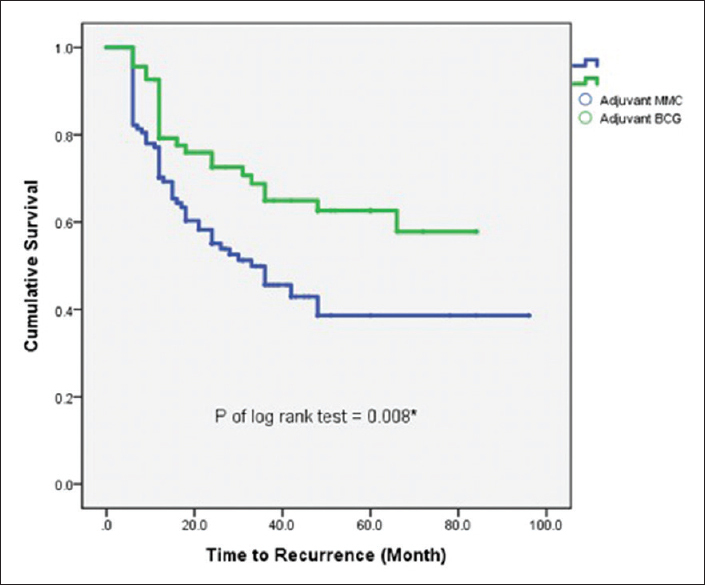 The value of adjuvant instillation therapy was confirmed by large meta-analysis, with a 44% reduction, on the recurrence rate in TURBT with adjuvant chemotherapy when compared to TURBT alone. Even though reports comparing BCG and MMC in treating BC are conflicting across investigators, two meta-analyses and one randomized control trial supported the superiority of BCG, consistent with what was observed in our present study.,, In one of the above reports, they found the reduction of tumor progression as the consequence of controlled BCG application with 3-weekly maintenance instillations at months 3, 6, 12, 18, 24, 30, and 36. We also followed the treatment protocol of maintenance therapy as close as possible. However, this point was not taken into discount due to limited sample size as only a few patients had completed the maintenance course of 3 years. The value of our study is that all patients were newly diagnosed, treatment-naive and we declared the efficacy of two adjuvant regiments following TURB. We found that compared to MMC, BCG had a 48.9% reduction risk of recurrence and 78.5% reduction risk of progression. Our findings also echoed well with the current practice guidelines that BCG is indicated in intermediate and high risk of recurrence. Immediate single instillation significantly reduces the recurrent rate compared to BCG alone, and the latest meta-analysis reported a reduction of 5 years recurrence from 59% down to 45% but no benefits in disease progression. However, for those patients with EORTC recurrence score ≥5 or prior recurrence rate of >1/year, such benefit in recurrence was not observed. 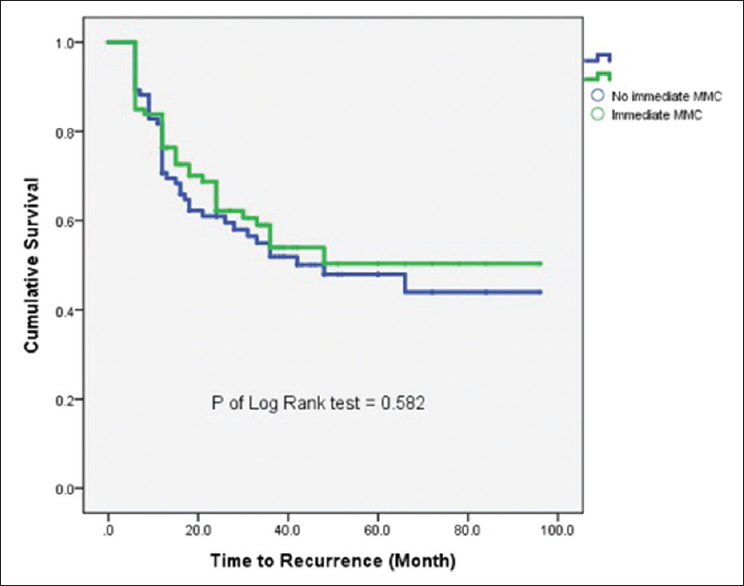 For patients with T1 high-grade tumor, we found that there are also neither benefits in recurrence nor progression for single immediate instillation after the first TURBT and the benefit may be less, while further combination therapy should be considered. In addition, single immediate instillation should not be used in cases in doubt of bladder rupture following TURBT that may induce systemic reaction or toxicity. The efficacy of combination therapy with immediate MMC and adjuvant BCG has been examined in one randomized control trial, and results on patients of intermediate to high risks suggested application benefits in reducing recurrence but at the expense of greater toxicity. Although this issue was not explored in our study, we observed that 28% of our patients receiving immediate MMC in the BCG group exhibited tolerable side effects, suggested that this treatment regimen may be an option given more future work. Risk factors that could influence tumor recurrence and progression are patient characteristics such as ESRD, smoker, Chinese herb, and hair dye and tumor factors such as CIS, multiple lesion, tumor diameter, and coexisted upper tract urothelial carcinoma.,,,, With the uni-multivariates model, all these factors in our study showed a trend of increasing the risk of recurrence and progression. The trend was however not statistically significant which could be related to very progressive nature of the T1 high-grade BC. We have to point out several limitations of our study. First, and also the most important one, is the retrospective nature of the analysis, and therefore, the results were inevitably subjected to selection bias. For example, for ESRD patients, the physician may have chosen MMC as the adjuvant therapy for fewer side effects and lower risks of infection. Second, the maintenance therapy was not taken into consideration and the results could have underestimated the maintenance effects and overestimated the treatment efficacy. Third, re-staging TURBT was not stratified universally for all patients. It was only performed in cases of suspected incomplete resections and it would be hard to different tumor persist or recurrence at 3 months. For this reason, pathology report beyond this time would be thought as tumor recurrence. Furthermore, for risk factors' evaluation such as smoker, herb used or hair dye, we can only recognize from medical record and lack of the information about ex-smoker or current smoker while the cumulative effect may be under estimated. Despite these limitations, our real-world single-center experience could help physicians in the selection of treatment regiments for patients with T1 high-grade nonmuscle invasive BC. We found that for patients with T1 high-grade nonmuscle invasive BC, the adjuvant therapy with BCG showed benefits in preventing recurrence and progression when compared to MMC, and the treatment complications were tolerable. The efficacy of immediate single instillation was lower in preventing recurrence and progression in this patient group. Jacobs BL, Lee CT, Montie JE. Bladder cancer in 2010: How far have we come? CA Cancer J Clin 2010;60:244-72. Health Promotion Administration, Ministry of Health and Welfare. Cancer Registry Annual Report. Taiwan: Ministry of Health and Welfare; 2012. Available from: https://www.hpa.gov.tw/Pages/ashx/File.ashx?FilePath=~/File/Attach/5191/File_6166.pdf. Chen CJ, Chuang YC, Lin TM, Wu HY. Malignant neoplasms among residents of a Blackfoot disease-endemic area in Taiwan: High-arsenic artesian well water and cancers. Cancer Res 1985;45:5895-9. Ghoneim MA, Abdel-Latif M, el-Mekresh M, Abol-Enein H, Mosbah A, Ashamallah A, et al. Radical cystectomy for carcinoma of the bladder: 2,720 consecutive cases 5 years later. J Urol 2008;180:121-7. Tolley DA, Parmar MK, Grigor KM, Lallemand G, Benyon LL, Fellows J, et al. The effect of intravesical mitomycin C on recurrence of newly diagnosed superficial bladder cancer: A further report with 7 years of follow up. J Urol 1996;155:1233-8. Hendricksen K, Witjes WP, Idema JG, Kums JJ, van Vierssen Trip OB, de Bruin MJ, et al. Comparison of three schedules of intravesical epirubicin in patients with non-muscle-invasive bladder cancer. Eur Urol 2008;53:984-91. Oosterlinck W, Kurth KH, Schröder F, Bultinck J, Hammond B, Sylvester R, et al. A prospective European Organization for Research and Treatment of Cancer Genitourinary Group randomized trial comparing transurethral resection followed by a single intravesical instillation of epirubicin or water in single stage Ta, T1 papillary carcinoma of the bladder. J Urol 1993;149:749-52. Amling CL, Thrasher JB, Frazier HA, Dodge RK, Robertson JE, Paulson DF, et al. Radical cystectomy for stages Ta, Tis and T1 transitional cell carcinoma of the bladder. J Urol 1994;151:31-5. Huland H, Klöppel G, Feddersen I, Otto U, Brachmann W, Hubmann H, et al. Comparison of different schedules of cytostatic intravesical instillations in patients with superficial bladder carcinoma: Final evaluation of a prospective multicenter study with 419 patients. J Urol 1990;144:68-71. Smith JA Jr., Labasky RF, Cockett AT, Fracchia JA, Montie JE, Rowland RG, et al. Bladder cancer clinical guidelines panel summary report on the management of nonmuscle invasive bladder cancer (stages Ta, T1 and TIS). The American Urological Association. J Urol 1999;162:1697-701. Malmström PU, Sylvester RJ, Crawford DE, Friedrich M, Krege S, Rintala E, et al. An individual patient data meta-analysis of the long-term outcome of randomised studies comparing intravesical mitomycin C versus bacillus Calmette-Guérin for non-muscle-invasive bladder cancer. Eur Urol 2009;56:247-56. DeBruyne FM, van der Meijden AP, Geboers AD, Franssen MP, van Leeuwen MJ, Steerenberg PA, et al. BCG (RIVM) versus mitomycin intravesical therapy in superficial bladder cancer. First results of randomized prospective trial. Urology 1988;31:20-5. Mangiarotti B, Trinchieri A, Del Nero A, Montanari E. A randomized prospective study of intravesical prophylaxis in non-musle invasive bladder cancer at intermediate risk of recurrence: Mitomycin chemotherapy vs. BCG immunotherapy. Arch Ital Urol Androl 2008;80:167-71. Böhle A, Jocham D, Bock PR. Intravesical bacillus Calmette-Guerin versus mitomycin C for superficial bladder cancer: A formal meta-analysis of comparative studies on recurrence and toxicity. J Urol 2003;169:90-5. Sylvester RJ, Brausi MA, Kirkels WJ, Hoeltl W, Calais Da Silva F, Powell PH, et al. Long-term efficacy results of EORTC genito-urinary group randomized phase 3 study 30911 comparing intravesical instillations of epirubicin, bacillus Calmette-Guérin, and bacillus Calmette-Guérin plus isoniazid in patients with intermediate- and high-risk stage ta T1 urothelial carcinoma of the bladder. Eur Urol 2010;57:766-73. Shang PF, Kwong J, Wang ZP, Tian J, Jiang L, Yang K, et al. Intravesical bacillus Calmette-Guérin versus epirubicin for ta and T1 bladder cancer. Cochrane Database Syst Rev 2011;(5):CD006885. Huncharek M, McGarry R, Kupelnick B. Impact of intravesical chemotherapy on recurrence rate of recurrent superficial transitional cell carcinoma of the bladder: Results of a meta-analysis. Anticancer Res 2001;21:765-9. Babjuk M, Böhle A, Burger M, Capoun O, Cohen D, Compérat EM, et al. EAU guidelines on non-muscle-invasive urothelial carcinoma of the bladder: Update 2016. Eur Urol 2017;71:447-61. Sylvester RJ, Oosterlinck W, Holmang S, Sydes MR, Birtle A, Gudjonsson S, et al. Systematic review and individual patient data meta-analysis of randomized trials comparing a single immediate instillation of chemotherapy after transurethral resection with transurethral resection alone in patients with stage pTa-pT1 urothelial carcinoma of the bladder: Which patients benefit from the instillation? Eur Urol 2016;69:231-44. Solsona E, Madero R, Chantada V, Fernandez JM, Zabala JA, Portillo JA, et al. Sequential combination of mitomycin C plus bacillus Calmette-Guérin (BCG) is more effective but more toxic than BCG alone in patients with non-muscle-invasive bladder cancer in intermediate- and high-risk patients: Final outcome of CUETO 93009, a randomized prospective trial. Eur Urol 2015;67:508-16. Burger M, Catto JW, Dalbagni G, Grossman HB, Herr H, Karakiewicz P, et al. Epidemiology and risk factors of urothelial bladder cancer. Eur Urol 2013;63:234-41. Chavan S, Bray F, Lortet-Tieulent J, Goodman M, Jemal A. International variations in bladder cancer incidence and mortality. Eur Urol 2014;66:59-73. Freedman ND, Silverman DT, Hollenbeck AR, Schatzkin A, Abnet CC. Association between smoking and risk of bladder cancer among men and women. JAMA 2011;306:737-45. Fernandez-Gomez J, Madero R, Solsona E, Unda M, Martinez-Piñeiro L, Ojea A, et al. The EORTC tables overestimate the risk of recurrence and progression in patients with non-muscle-invasive bladder cancer treated with bacillus Calmette-Guérin: External validation of the EORTC risk tables. Eur Urol 2011;60:423-30.
van Rhijn BW, Zuiverloon TC, Vis AN, Radvanyi F, van Leenders GJ, Ooms BC, et al. Molecular grade (FGFR3/MIB-1) and EORTC risk scores are predictive in primary non-muscle-invasive bladder cancer. Eur Urol 2010;58:433-41.